I know this is not realy a casting project, but it is for a casting project! 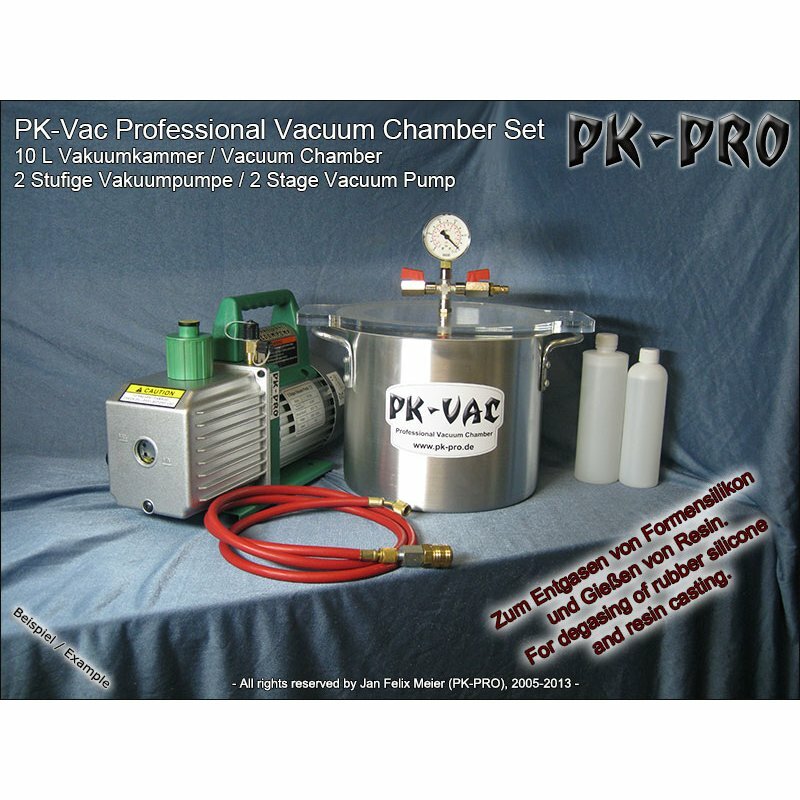 I designed my own PK-PRO vacuum chamber. To be honest, it is not realy new to all of you, but I made some slightly differences to the common chambers. 1. I am using a industrial quality silicone rubber sealing. 2. All metal parts are made in Germany and assambled by me. I created this chamber 6 years ago for my own use. Then I build it for differend customers till I started to sell them online now! I just bought the 8 CFM version of that pump to replace my 3.5 CFM. I think 3 CFM may be a little underpowered but that looks like a nice kit! My thoughts were the same as Fleafa's. 3CFM does sound a little low for a 10L pot? Correct me if my math is wrong, but shouldn't a 3.5 CFM clear a 10L pot in about 6 seconds? Your maths has to be wrong! My 3.5 CFM certainly didn't manage that! Islacrusez wrote: Correct me if my math is wrong, but shouldn't a 3.5 CFM clear a 10L pot in about 6 seconds? 3CFM will theoretically take about a minute (and in practice will be longer). Yes, there is! Lucky we spotted it for you! 8CFM will be excellent and evacuate the chamber in under 25 seconds. So what is the math? Will a 3.5 cfm pump only pump 3.5 cfm if both sides of the pump are at 1 atm, and performance drops as pressure decreases? In short, why is it that a 3.5 cfm pump will take 1 minute to clear 0.35 cu feet? Basically, yes, the deeper the vacuum becomes, the slower it is to vacuum. The calculation involves a natural logarithm.